The NS-SW700 subwoofer meets the challenge of providing an idealbalance between tight sounds (with crisp, fast attack) and deep sounds (with aspacious feeling). Although these two types of sounds, by definition, tend tooppose each other, this subwoofer is capable of accurately rendering the toneintervals of all kinds of sounds, so the music is ideally balanced. Finally, the enjoyment derived from the NS-SW700 is not restricted to your ears— with it's impressive power it lets you feel the music, too. The NS-SW700 subwoofer delivers high power outputs at deep bass levels,with excellent stability and low power consumption, even with their compactcabinets. This is made possible by a power amplifier that delivers stable power outputwith high efficiency while minimising power consumption and heat production. It does not require an output filter coil, resulting in extremely low noise anddistortion. High speed transient response is also excellent. Yamaha's Advanced YST II (Yamaha Active Servo Technology II) usesAdvanced Negative Impedance Converter (ANIC) circuits to maintain excellentlinearity. This means more stable and accurate low range response and higher soundpressure levels, for more natural and energetic bass reproduction. QD-Bass (Quatre Dispersion Bass) technology uses down-firing driverswith square, pyramid-shaped reflective plates to radiate the sound efficientlyin four horizontal directions. It provides extraordinary power and smooth frequency response from an extremelycompact unit. It also allows greater freedom of placement, since the soundradiates with equal effectiveness in all directions. The Linear Port provides smooth bass response while minimisingextraneous noise. The BASS (Bass Action Selector System) function lets you switch betweenMovie and Music modes, provi ding the optimumfrequency response in each case. The NS-SW700 subwoofer meets the challenge of providing an ideal balance between tight sounds (with crisp, fast attack) and deep sounds (with a spacious feeling). 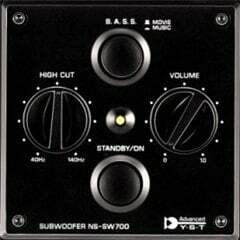 Although these two types of sounds, by definition, tend to oppose each other, this subwoofer is capable of accurately rendering the tone intervals of all kinds of sounds, so the music is ideally balanced.Finally, the enjoyment derived from the NS-SW700 is not restricted to your ears — with it's impressive power it lets you feel the music, too. The NS-SW700 subwoofer delivers high power outputs at deep bass levels, with excellent stability and low power consumption, even with their compact cabinets. This is made possible by a power amplifier that delivers stable power output with high efficiency while minimising power consumption and heat production. Yamaha's Advanced YST II (Yamaha Active Servo Technology II) uses Advanced Negative Impedance Converter (ANIC) circuits to maintain excellent linearity. This means more stable and accurate low range response and higher sound pressure levels, for more natural and energetic bass reproduction. QD-Bass (Quatre Dispersion Bass) technology uses down-firing drivers with square, pyramid-shaped reflective plates to radiate the sound efficiently in four horizontal directions. It provides extraordinary power and smooth frequency response from an extremely compact unit. It also allows greater freedom of placement, since the sound radiates with equal effectiveness in all directions. The Linear Port provides smooth bass response while minimising extraneous noise. The BASS (Bass Action Selector System) function lets you switch between Movie and Music modes, providing the optimum frequency response in each case.